Japanese Episode AG 132: "The End of the Fierce Fighting! The Road to the Championship!" American Episode 402: "At the End of the Fray"
The battle continues as Tetsuya's Jukain and Satoshi's Onigohri knock each other out! The two trainers choose their next pokemon, with Tetsuya picking Dartengu and Satoshi picking Cotoise. Satoshi's fire-type defeats Tetsuya's grass-type with a Flamethrower attack, prompting Satoshi's opponent to call out Hariteyama. 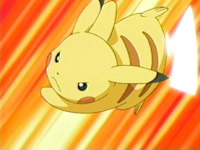 The fighting-type pokemon has the Thick Fat characteristic, making it resistant to all of Cotoise's fire attacks. After defeating Satoshi's pokemon, Hariteyama finds itself pitted against Heigani. The crab pokemon puts up a good fight, but it eventually falls to Tetsuya's pokemon as well. After the intermission, Satoshi calls on his Ohsubame to face Tetsuya's Hariteyama. Even though the bird pokemon takes some damage, it is able to pull through with a victory when it uses Aerial Ace to knock out its opponent. Tetsuya chooses Donphan next. The elephant pokemon attacks fiercely, but it is unable to win after Ohsubame picks it up and throws it across the field. Tetsuya's fifth pokemon is his Metagross, who easily defeats Ohsubame with its psychic attacks. Satoshi is wondering how he can possibly win when he spots a weak spot on Metagross' body. The young trainer calls out Juptoru next and has it focus its attacks on the weak spot, hoping it will be enough to defeat the massive pokemon. By hitting the same spot repeatedly while dodging Metagross' attacks, the grass-type pokemon is able to weaken its opponent before being taken out. Satoshi's final pokemon choice is his Pikachu, who finishes the job Ohsubame and Juptoru started. After Metagross is defeated, Tetsuya calls on his Nyasu in Boots! The two trainers' pokemon duke it out, neither one appearing to have an advantage over the other. At the end of the battle, Pikachu simply runs out of stamina and faints, giving Tetsuya the victory. Satoshi is proud of the work his pokemon have put in and watches as Tetsuya continues to progress through the tournament, eventually placing first. As the closing ceremony comes to an end, Satoshi wonders what adventures await him. As always, the ending to the league is rushed as hell. This time, though, I can kind of understand why. This episode first aired in Japan on June 16th, 2005. That's a little under a month before that year's movie, Myuu and the Wave-Guiding Hero, Lucario was set to debut in theatres. Now, that movie uses Battle Frontier as its opening theme, and my guess is that they wanted to be able to hype that song through the regular TV series before showcasing it in the new movie. So, in order to do that, they had to rush the end of the league so they could hurry up and debut Battle Frontier in the regular series. I have absolutely nothing to back this theory up with, but it seems to be the most logical reason for the rushed league finale. As for the episode itself, it was good enough, I guess. Though I do think it's a bit strange to show sparks coming out of Metagross' body since that suggests that it's some kind of robot or something. The dubbed version isn't really all that special, edit-wise. Just the same old same old. The first three seconds of the episode are trimmed. Later, a second is removed from the shot after the Trainer's Choice commercial break. From the moment after Satoshi loses until the Rocket-Dan are sent blasting off, Pokémon Symphonic Medley is heard playing in the background. This is replaced by instrumental music in the dub. Right as the above cut is happening, the current ending theme to the series, Glory Day, plays until the end of the episode. This is all replaced by instrumental music in the dub. Two seconds are trimmed from the TO BE CONTINUED... screen.